As I walked out of the airport in Delhi, we were greeted with a thick brownish-grey smog in the horizon. 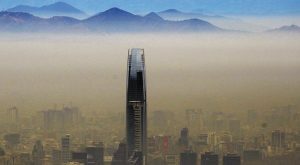 Immediately it felt like home – Santiago, the capital of Chile – which is also one of most the highly air polluted cities of the world. Back home when I wake up, I enjoy the clean air because the heavy-duty air filter in my bedroom is constantly on. The only way to physically see how bad the pollution is on any given day is to walk over to my window and look out. On winter days it is not unfamiliar to see a brown cloud, similar to the picture above, hovering above Santiago. The magnificent Andes Mountains surrounding the city are usually shrouded in smog. My morning routine when going into the city consists of me checking the Air Quality Index online or on my phone. I followed this practice when I got to India. The air quality in Chennai, the city where we spent the majority of our time, was usually moderately polluted ranging from 51 to 100 ppm (parts per million). However, when we arrived in Delhi the pollution was noticeably worse; it was at 362 ppm which is considered hazardous. Indian visitors walk through the courtyard of Jama Masjid amid heavy smog in the old quarters of New Delhi on November 8, 2017. Delhi shut all primary schools on November 8 as pollution levels hit nearly 30 times the World Health Organization safe level, prompting doctors in the Indian capital to warn of a public health emergency. Dense grey smog shrouded the roads of the world’s most polluted capital, where many pedestrians and bikers wore masks or covered their mouths with handkerchiefs and scarves. Photo by: Sajjad Hussain. airborne particles representing the most threatening ones. The measurement is broken down into a numerical yardstick. Air quality numbers under 100 are considered to be adequate, and numbers above 100 are considered unhealthy and so on. This air pollution is not only unsightly but also causes major health problems. According to Dr. Randeep Guleria, head of the Department of Pulmonology and Sleep Disorders at the All India Institute of Medical Sciences in Delhi, “We see the acute effects of air pollution, especially in young children and the elderly, and in people suffering from chronic obstructive pulmonary disease and heart disease.” Air pollution can cause breathing difficulties, cardiovascular diseases, adverse pregnancy outcomes (such as preterm birth), and even death. Chile faces similar problems. The World Health Organization (WHO) estimates that 12% of deaths in Chile are caused by the contaminated environment, or 11,300 deaths annually. While this seems catastrophic, this percentage actually makes Chile the country with the least deaths resulting from a contaminated environment in Latin America. In comparison, the WHO attributes 11% of deaths in India to a contaminated environment, but the death toll is much higher, 1.5 million, since the population size is much larger. 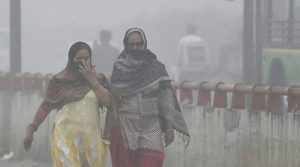 New Delhi: Women try to protect themselves from heavy smog and air pollution that reached hazardous levels in New Delhi on Wednesday. Yesterday the air quality hit severe levels in New Delhi. PTI Photo by Manvender Vashist. 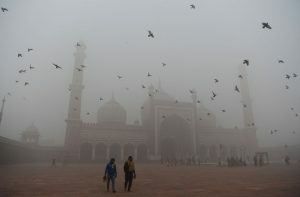 According to the WHO more action has been taken in Delhi than in any other city to tackle the problem of air pollution. “The auto-rickshaws run on compressed natural gas and, earlier this year, the state government piloted a congestion scheme to reduce the volume of traffic, in which vehicles with odd and even number plates could enter the city on alternate days.” Similar policies have also been implemented in Chile: if I want to drive in the winter I always have to check if my license plate is prohibited from circulating on that day. Cars are taken off the road when the daily air quality is bad by prohibiting plates ending in certain numbers to circulate. Even though traffic reduction has been found to make a significant reduction in air pollution this problem is multifaceted. “Recently the Indian government took some steps in this direction committing to a 50% reduction in households using solid fuel for cooking and, last December, removing subsidies for polluting cooking gas to improve access to clean fuel for household cooking (WHO).” India is certainly on the right track to improving air quality, but based on my experience in Chile, many of these actions reduce pollution somewhat but not enough to provide citizens with the clean air their bodies need to thrive and be healthy. It’s time for both countries to dramatically change policies and commit greater resources to dramatically improve air quality for its citizens.